Hello all! As I mentioned, I will be having some lovely guest posters popping by over the next little while, and one of them is Carol from The Design Pages. Carol is a talented designer who is a kindred spirit! Somehow we found each other in blogland and have emailed back and forth since...we have similar tastes in books too - Carol is my partner in Crime for the Blogger Book Club. Check out some of Carol's insight below and her blog for a regular dose! Hello to all of you Interior Groupie readers. I"m so happy to be here today at one of my very favourite blogs. When Heather said I could write about anything I knew immediately that it would involve colour. This trend may not be new to you or maybe it is but it's one that I adore and have plans of my own to incorporate into our home. 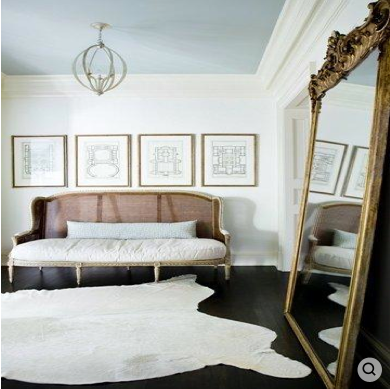 PAINTED CEILINGS - Say What??? For years and years I've been trying to convince clients to be brave and do a bit of colour on the ceiling instead of just plain white. White ceilings tend to draw the eye up but by adding either a tint of the wall colour or a shade lighter than the wall colour it becomes invisible, which is really what we want, right? We really don't need to emphasize the ceiling, right? Well now I'm seeing a brand new trend. Painted ceilings. I don't mean a little bit of colour but I mean an actual paint colour. This brave homeowner added a big punch of colour but I love the way it connects with the colour down below in the print. Blue is the most popular ceiling colour right now because of the feeling of the sky and the connection to outdoors. If you live in the west coast as I do you have a need to see blue sky even if it's indoors. This ceiling was gold leafed which creates a light shimmery effect. Maybe a great solution for a dark space. I love this kitchen. 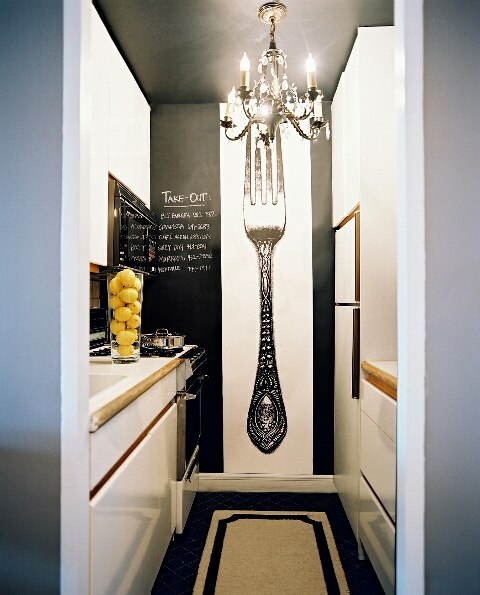 What a great way to distract from the dated, cramped space with all the drama. SOOOO, what do you think? Are you brave enough to add some colour to your ceiling? Pinning it! 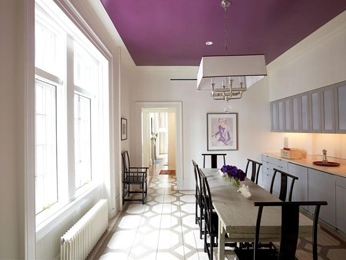 I love the purple painted ceiling, I'm redoing my brother's house, do you think he'll go for purple? ;) Maybe a more masculine color! I love all of these. 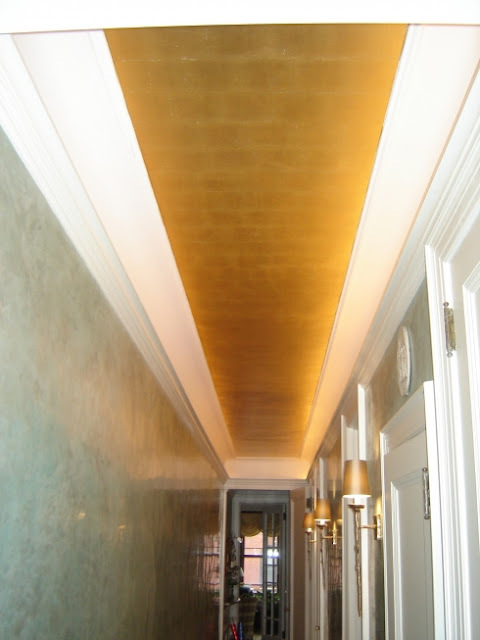 I painted the ceiling in the dining room of our last house a dark color and it was very dramatic.